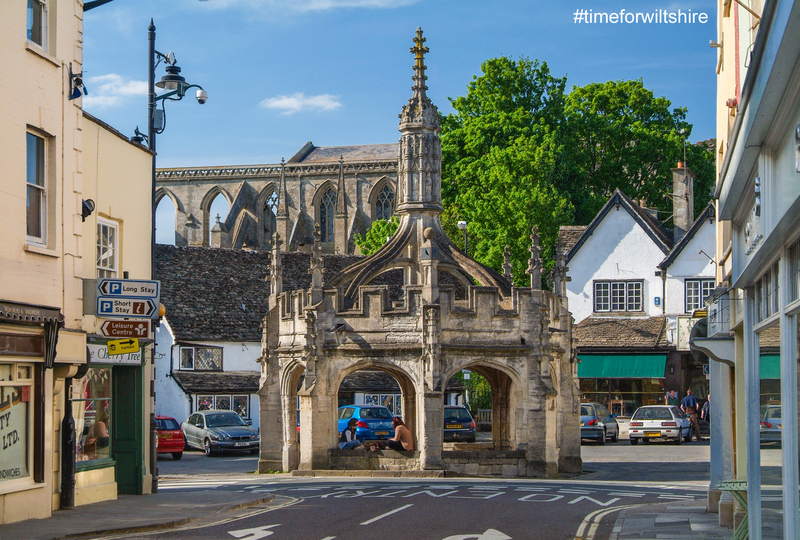 Malmesbury in Wiltshire…a town buzzing with vibrancy and charm, there is so much to discover! Malmesbury is full of history stretching back centuries. It’s a town with a story to tell. In 2012 a metal detectorist found The Malmesbury Coin Hoard in a field in Milbourne, Malmesbury. This is a rare collection of 1266 Roman coins within the remains of the original pot. The coins date from the early C4th century and are now being conserved. The Heritage Lottery Fund, the Association of Independent Museums, the Malmesbury Area Board and public donations have supported the project. Close to the Cotswolds and nestled atop an old Iron Age hill fort, it is thought to be England’s oldest borough. Alfred the Great granted a Charter around 880. The Abbey, founded in 675, had the first church organ in England. The Abbey was even the site of an early attempt at human flight! The monk, Elmer of Malmesbury flew a primitive hang glider from a tower. Elmer was born in about 980 AD. As a young monk, he tried to make a flight from the tower of the Abbey in 1010. Elmer fastened wings to his arms and his feet, and jumped from the top of a tower, either a Saxon watchtower, or the old Abbey. Elmer watched Jackdaws in flight and learned how to make use of the currents of air to glide. He covered a distance of around a furlong (about 200 metres) before falling, breaking both his legs. He believed that he would have had more stability if he had provided himself with a tail. Elmer planned a refined attempt but the Abbot prevented it. Elmer lived a long life as a respected scholar and is now to be seen in a stained-glass window. By 1066, the town was one of the most significant in England. It grew as a religious centre; the third Abbey on the site of the C12th Abbey had a 130m spire 7m taller than the spire of Salisbury Cathedral. The spire collapsed in the late C15th and the surviving part of the Abbey is now the parish church. Following this, the town’s reputation as a technical hub grew. It was the home of radar during WWII. 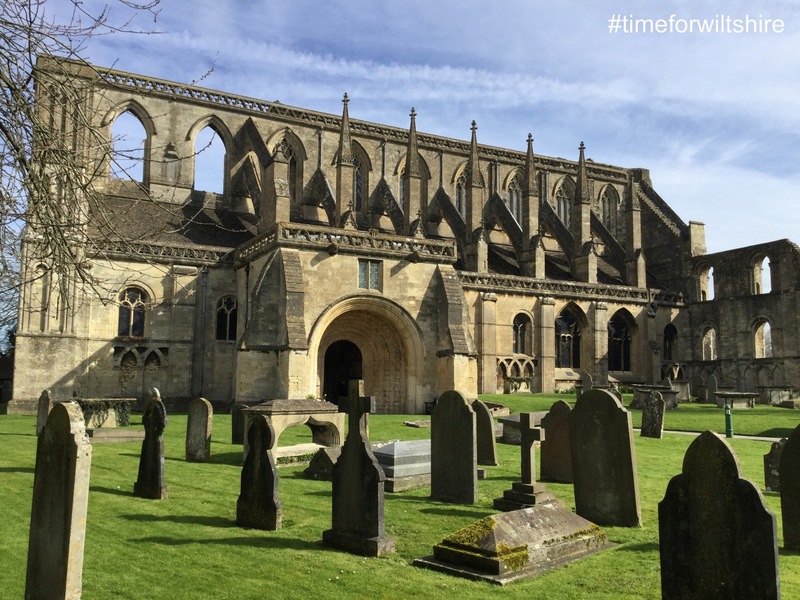 Malmesbury is perfectly placed for an afternoon visit or day trip or you can base yourself here for a short break. Visitors can enjoy a guided walk or an exploration of the unique Abbey. A walking trail is available from the Tourist Information Centre. Athelstan Museum which has local artefacts and knowledge of local history is the place to start your visit. The Museum is named after the first ‘King of All England’ who is buried nearby. The town is filled with historical architecture. Beside the Abbey Church and straddling the River Avon you will find the Abbey House Gardens, which boasts the UK’s largest collection of roses. It’s a spectacular five-acre garden with over 1,000 years of history and burial place of an English king. The plants have constant colour from March to November. The Market Cross, dates back to the C15th. Discover the Old Courtroom and Almshouses or find out more at the Athelstan Museum or TIC at the Town Hall. Visitors may also like Foxley Road Nurseries, a garden nursery on the outskirts of town. Take a trip to Hilditch Auctions, the UK’s leading catering equipment auction house. The general auction sales contain household goods, electronics, gardening tools and furniture and much more. There is a busy musical, cultural and social calendar with lots of regular seasonal events. Home to popular music and food festivals it is a hub for music lovers and creativity. There are art exhibitions, street theatre and even skateboarding in the Abbey. Every year Malmesbury welcomes the globally loved WOMAD Festival to CharltonPark. For one weekend in July, visitors travel from near and far to enjoy international music, culture and cuisine. The ever popular Malmesbury Carnival and Festival (running for over 90 years), takes place in August to early September. The Carnival showcases the best of local cuisine and talent with numerous daily festivities. The procession closes the festival which is always a spectacular finale. With year round events including Boondocks Festival, St Aldhelm’s Day, Town Walks, Fireworks and Late Night Christmas Shopping, there’s lots to keep you busy. Sponsored by Malmesbury Town Council and The Wilts and Glos Standard, Malmesbury in Bloom is a riot of gardening zeal. Every year gardeners of all varieties bring colour and interest to the town in attempts to win coveted titles. Information is available from the Town Council or the TIC. 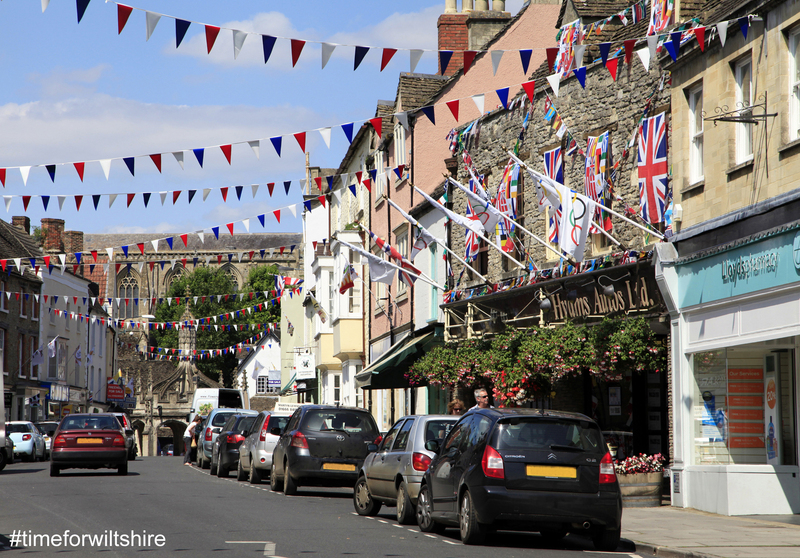 Malmesbury’s charming streets and thriving high street showcase an array of unique, independent shops. There’s even a weekly Artisan and Farmers’ Market at the Market Cross (every Friday). A range of food and drink options are available for a well-deserved rest, suitable for all palettes and budgets. Try staying at the oldest hotel in England! The Old Bell Hotel offers character and charm dating all the way back from c.1220. With a range of bed and breakfasts, hotels and campsites in town, there’s a place to suit everyone. There’s also The Old Coach House set close by in the pretty village of Corston. The School House Bed & Breakfast is a historic grade II Listed old school set in the heart of the nearby village of Charlton. The Best Western Mayfield House Hotel, in Crudwell is a great family (and dog) friendly hotel. 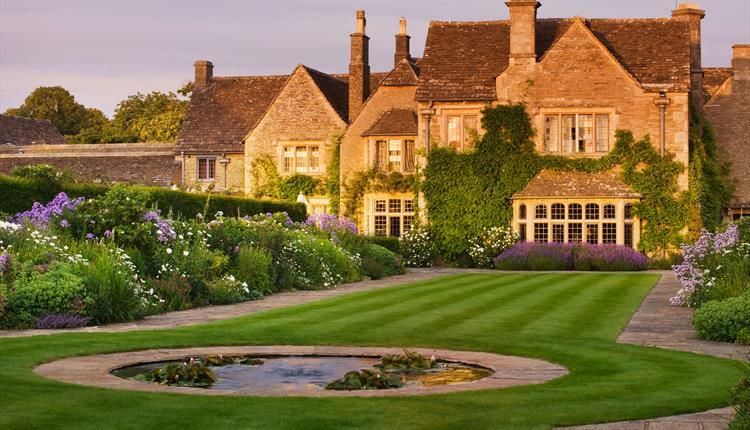 Whatley Manor Hotel & Spa is a five star hotel in Eastern Grey. It has the exclusive charm of a timeless private residence with fine architecture and gardens in a magical tranquil setting. It has excellent cuisine with a Michelin two-star restaurant. The jewel in its crown is Spa Aquarias, offering a range of spa facilities and treatments to restore mind and body. Malmesbury is north of M4 Junction 17 on the A429. The nearest railway stations are at Chippenham or Kemble, with direct services from London. Local bus services and taxis are available. There is also two hours free car parking available at Station Road Car Park. Westonbirt Arboretum is just five miles away from Malmesbury with around 15,000 trees from all over the world. Other close-by attractions include Bowood House & Gardens, Longleat, Lacock Abbey and the Cotswold Water Park. St James Church at Draycot Cerne is a small handsome church set in parkland above a river. While the Church of St Margaret of Antioch is a dramatic Victorian building constructed in 1846 using parts of its C12th predecessor.